On Thursday, Trump delivered himself of one of the most brain-dead speeches ever given by an American president, more imbecilic even than Bush’s “Mission Accomplished” or Nixon’s “I am not a crook.” He withdrew from the Paris climate accords, saying that he was elected to represent Pittsburgh, not Paris. Trump alleged that he was somehow protecting the United States from dastardly furriners in cancelling the Paris commitment. Climate change is on a spectrum. We can put up the temperature 3.6 degree Fahrenheit or we can put up the temperature 12 degrees F.
In fact, the US is particularly liable to damage from climate change. Here are the parts of the country he just deeply damaged. Trump hasn’t given Pennsylvania more rust belt jobs. He has given it more Johnstown floods. 2. The Deep South and the Gulf coast. 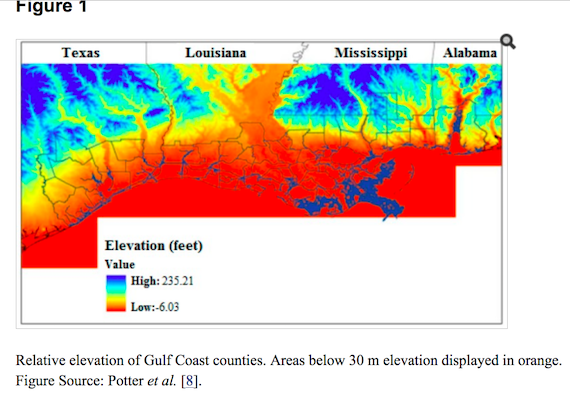 The Gulf Coast, then, has been sunk by Trump. 4. Or consider the impact on Tennessee:. “more severe droughts and more hot days are likely to reduce [crop] yields, especially in the western half of Tennessee: 70 years from now, that part of the state is likely to have 15 to 30 more days with temperatures above 95°F than it has today. Even on irrigated fields, higher temperatures are likely to reduce yields of corn, and possibly soybeans. Warmer temperatures are also likely to reduce the productivity of dairy and other cattle farms. Tennessee, in other words, is going to be very hot and produce much less food. So, hot and hungry. 5. And then there is Florida, where rising sea levels will devastate cities and submerge the state over time. So maybe that should be, there used to be Florida.